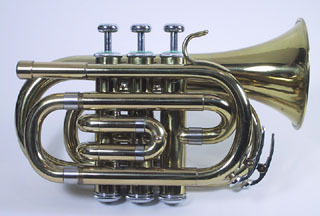 Most current-day pocket cornets are actually pocket trumpets – that is, they have receivers intended to accept the slightly larger trumpet mouthpiece. 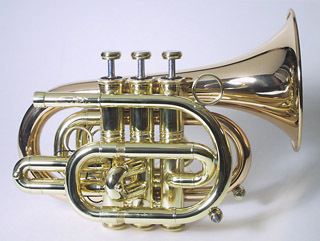 In fact, it only takes an inexpensive trumpet-to-cornet adapter to be able to use a cornet mouthpiece. In my opinion, they sound much better this way. 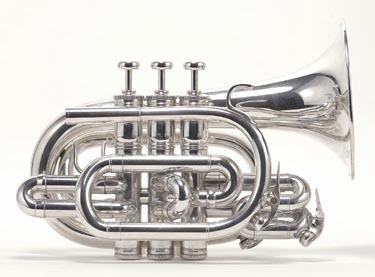 In the low to moderate price range, the best easily-available pocket trumpet for the money has long been the Jupiter 416, which is available in silver or lacquered brass finish. 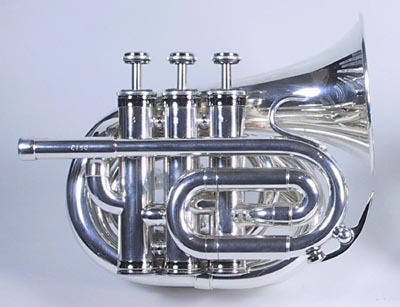 They are reasonably well made, have decent valves, and play nicely. I would say that they compare favorably in quality with student level Yamaha instruments. 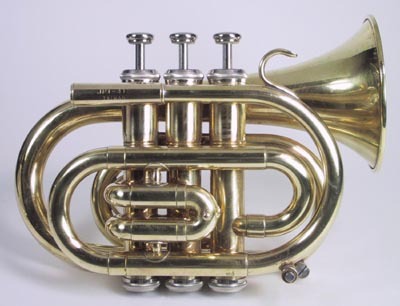 For kids small of stature, it is much easier to hold a pocket-configured cornet. I’m told by more serious players that these have some intonation problems. But for beginners, or playing jazz, I don’t find that to be a problem. But now there is competition, primarily from Taiwan-based Hoxon Gakki, makers of both Carol, Pocket Max and Phaeton. The price is close to (or less) than Jupiter, and the instruments are superior in my opinion. Hoxon seems to be happy to make private label horns for just about anybody. I’ve seen several other brands lately that are clearly the same as the Hoxon-made Pocket Max shown here. If it “looks like a duck and quacks like a duck...”, if you see my point! Beware the vast number of terribly made pocket trumpets which can be found on Ebay. Most are made in China and are worth what they sell for; usually under $100. Most repair shops will not even look at one of these if you have problems. Occasionally, even a “no-name” cheap pocket will play decently, and an be suitable for travel practice, or as a performance novelty. The trouble is that you can’t tell from pictures on the internet! Hakam Din still makes pocket trumpets in Pakistan, as they have for decades. But reports indicate serious problems with quality which I hope to verify myself. At the high end, Kanstul makes a very nice professional level pocket trumpet, similar to the Benge design made in the last few decades. 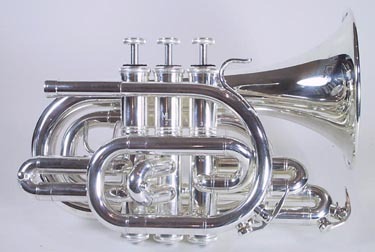 Benge still makes their pocket trumpet, but I’m told that the older Los Angeles-made examples are better. In any event, they are certainly more sought-after from what I can tell. I own a ‘75 Benge pocket, and have played another. Both are exceptional players.